Susan Kohler, an accomplished and experienced speech pathologist in California had a passion for the elderly and their families. The wisdom, stories and experiences they could share to enlighten the more youthful amazingly held keys pertinent to the welfare of their families and the communities they helped create. Unfortunately, the thick walls of dementias, such as Alzheimer's, imprisons the mind, heart and soul of these elderly gems so that family, friends, community, and the dementia patient all lose these enlightenments. Fortunately, Susan Kohler has paved a path for all of us to connect, in fact, communicate pleasantly and richly with these individuals. Ms. Kohler has delineated the path back to their mind, heart and soul to enable conversations and connections to become rich once again. Your family member or friend may never be what they were. We all change. Change is of course inevitable. Nonetheless, do not give up. 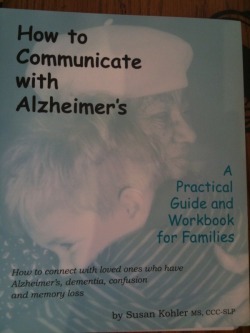 Ms. Kohler's Communication Strategies, laced with jokes, lyrics, fun activities, amazing photographs, and multiple ways to genuinely connect, will guide you step by step to reconnecting with those whom you knew before dementia took their mind away. Her techniques are very doable, sensible and full of heart. Below you can listen to an hour interview or upload it as an ipod or itune for you to share with others whom you know are too painfully impacted by this loss of their loved to the brain damage of Alzheimer's.